Posted on October 14, 2017 October 15, 2017 by BrandiePosted in cookbook review, Food PornTagged book giveaway, healthy slow cooking, salad not salad, vegan. I love Kathy Hester’s posts and recipes. Leftovers are generally great, but sometimes cooking smaller amounts is just right. Right? That’s exactly what this book made me see! That’s true. I also like freezing some things for later meals. I’m not big on leftovers. One or two servings is usually plenty for me. I can always make recipes again if I really want more. Since I am the only veg eater, this is perfect for me. ! I usually love having leftovers, but it depends on how much time I have to cook and prepare everything. I truly love making leftovers into something new- but sometimes I don’t want to do that. This book is perfect for moments like that. I like leftovers, but only a small amout. I hate eating the same thing over and over for days. This book sounds great! This would be the perfect book for you! I really need to get myself a slow cooker! I feel like I’m missing out on so many great recipes! You do! I love how you can prep, put it in the pot and forget about it until dinner time. 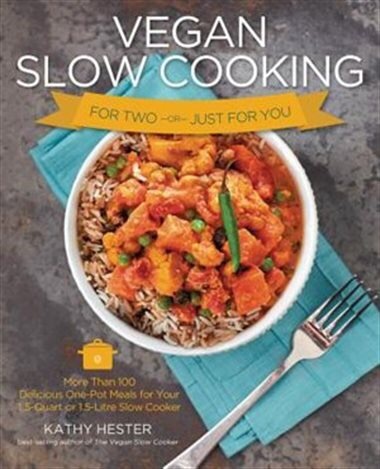 I love using my slow cooker, especially this time of year! Kathy has such great recipes on her website and in her other books. I haven’t yet picked up this one, however, it is going on my birthday wish list! As a single vegan, I don’t mind leftovers that freeze well. Otherwise, I prefer recipes that make just enough for 2-3 meals, so I’m not stuck eating the same thing all week long. I don’t mind leftovers for dishes I know I like, but I would rather try new dishes in small batches just in case we don’t like it as much. My husband and I don’t like leftovers in general. We cook in small quantities often. This book would be great!! A lot of people don’t like leftovers.